The Fantastic Four are looking to expand into a five-piece, and they have called you up to the task. Click here to play! Will you aid them in their quest for justice, reaping the rewards for your tireless work? Play Fantastic Four today across five reels and 25 pay lines, with the more lines activated multiplying your payout odds. Scattered symbols can pay out both left to right and right to left, and can appear anywhere on the reels for a hefty payout. 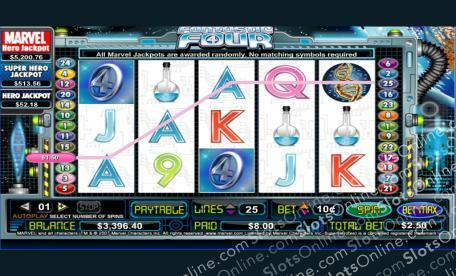 When three or more are spun in one go, the Fantastic Four feature will be awarded, where plenty of free games can be won. Mr. Fantastic, the Invisible Woman, the Human Torch, The Thing, and Dr. Doom are all substitute symbols and can be used to become any other symbol except Scatters. Additionally, when all five appear on an active pay line at once, you can win yourself up to 5000 times your original wager. Join the Fantastic Four today for the battle against evil. Will you prevail? The Fantastic Four symbol is Scattered and pays out up to 100 times your initial bet. When three or more logos appear, the Fantastic Four feature will begin, where you can win a ton of free prizes. Mr. Fantastic, the Invisible Woman, the Human Torch, The Thing, and Dr. Doom are all Substitute symbols as well as paying out at up to 5000:1.